Last fall, as part of our series on senses, we posted information on the sense of sight. We explained that, when babies are born, they can only see clearly about 8-12 inches away and much of what they see appears blurry. While learning to control the muscles of their eyes, young babies focus on faces of their caregivers and as they get older, they are able to focus on faces for longer and longer periods of time. When you consider that newborns tend to be held at chest level (about 8-12 inches from the caregiver’s face) for long periods, and that social interaction is important for survival, it makes sense that faces would be a baby’s favorite thing to look at! A study published late last year describes another possible benefit of spending time face-to-face with your baby. Researchers in Israel measured the heart rates of mothers and their 3-month old infants as they interacted with each other. They also videotaped each 3-minute interaction so they could compare aspects of the interaction (for example, facial expressions, body movements, and vocalizations) with shifts in the mothers’ and infants’ heart rates. After analyzing the videos and heart rate measurements, they found that the heart rates of the mothers and infants synchronized during the face-to-face interactions. Synchronization means that the mother’s heart rhythms became more like the infant’s and the infant’s became more like the mother’s. In addition, when the mothers and babies were focused most intently on each other (looking right at each other eyes, vocalizing, etc) their heart rhythms were even more coordinated. This could mean that if you are stressed and your baby is calm, each of your heart rates will change a little to be more similar to the other’s heart rate. This can lessen your stress. Alternately, if your baby is upset, simply letting her see your face can be calming. 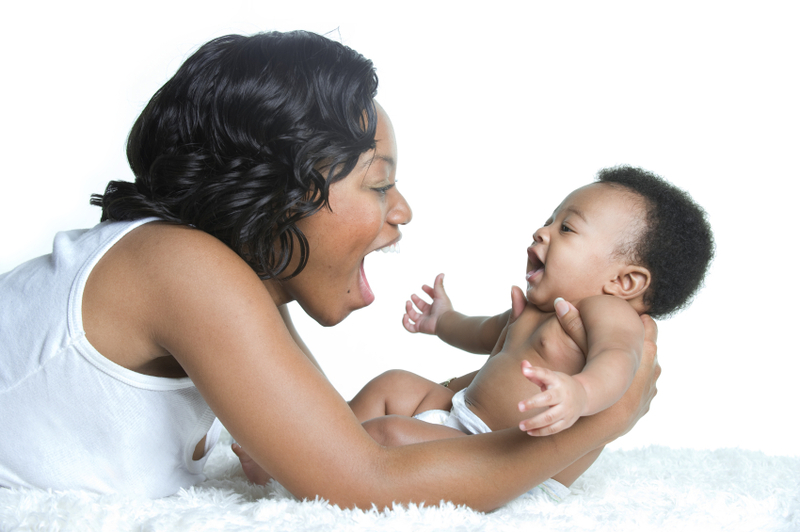 Eye contact with your baby can have a calming effect on your baby and you. Here are some other ways to increase face-time with your baby. Sit so your baby can see your face during feeding time. When your baby is older and eating in a high chair, maintain eye contact whenever you can as your baby explores his food. When it’s time for immunizations, make sure your face is in full view of your baby as you repeat calming words. During tummy time, get down on the floor face-to-face with your baby, this may help her tolerate tummy time a bit longer. When other friends or relatives are holding your baby and she is beginning to look uncomfortable, stand next to her and let her see your face. That may be all that she needs to calm down a bit. Parents often describe the calm feeling they get when they look at their babies. It is interesting that there may be a physiological reason behind this feeling and future research will provide even more information about the connection between parents and their babies.